Who Lt. Gen. Dwight D. Eisenhower (1890–1969) had overall command of Operation Torch, which consisted of three task forces. Commanding the Western Task Force (aimed at Casablanca) was U.S. Maj. Gen. George Patton (1885–1945). The Center Task Force (aimed at Oran) was commanded by U.S. Maj. Gen. Lloyd Fredendall (1883–1963). The Eastern Task Force (aimed at Algiers) was commanded by British Lt. Gen. Kenneth Anderson (1891–1959). Opposing the North African landings were roughly 125,000 Vichy French soldiers, as well as coastal artillery, 210 tanks, and about 500 aircraft. In addition, there were 10 or so warships and 11 submarines at Morocco. 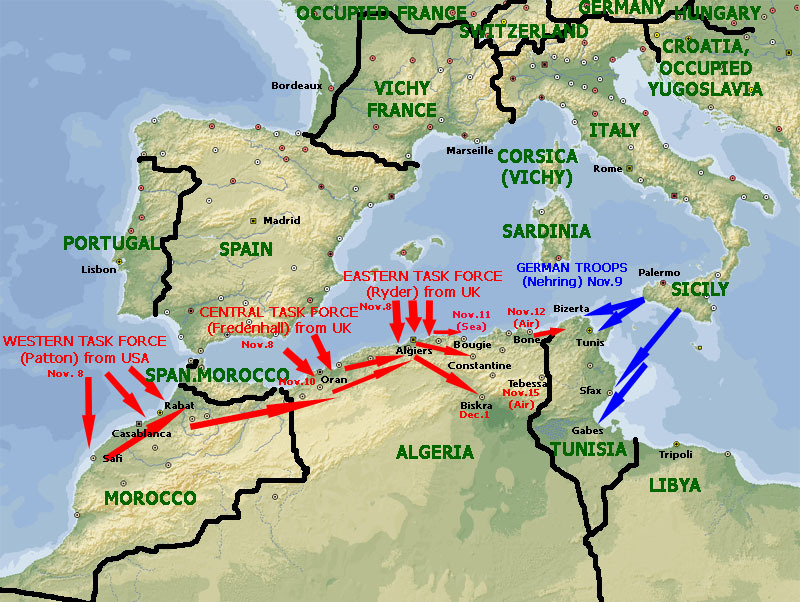 What Operation Torch was the Anglo-American invasion of French North Africa during the Allies’ North African Campaign (June 10, 1940 to May 13, 1943). Torch was sandwiched between campaigns in the Libyan and Egyptian deserts (Western Desert Campaign, also known as the Desert War) and in Tunisia (Tunisia Campaign). Operation Torch landed 100,000 U.S. and British troops at nine beachheads along the Moroc­can and Algerian coasts, assisted by 670 vessels and heavy air cover. During the eight-day operation, Allied forces suffered close to 500 dead and 720 wounded; Vichy forces suffered nearly 1,400 dead and 2,000 wounded. Why British Prime Minister Winston Churchill argued that Allied landings in French North Africa might persuade Marshal Philippe Pétain’s Vichy French government to come over to the Allied cause. Furthermore, a landing in Vichy Northwest Africa could trap and destroy German and Italian armies fighting the British in Egypt, whose presence safe­guarded Middle Eastern oil fields and ensured Allied passage through the Suez Canal to India and the Far East. President Franklin D. Roosevelt was eager to begin offensive action against Axis powers and settled on the southern fringe of the Nazi empire. Both Allied leaders had been pressured for some time by Soviet dictator Joseph Stalin to open up a second front in order to force Hitler to transfer troops from the Soviet front. Outcome Operation Torch was the largest Allied amphibious operation of the war up to that time and the first major airborne assault carried out by the U.S. After an initial storm of resistance, Vichy French forces in North Africa agreed to an armistice, which was quickly denounced by the Vichy government in France. Hitler and Italian dictator Benito Mussolini immediately ordered the occupation of Vichy France and reinforced Gen. Erwin Rommel’s Afrika Korps in Tunisia, where the Germans established a strong defensive line against Allied incursions from Algeria. Torch marked the beginning of the final stages Axis occupation of North Africa, which culminated in the surrender of eight Axis divisions (more than 230,000 men) near Tunis on May 12, 1943.